November 9, 2018 Riot has filed a number of trademark listings for Legends of Runeterra. A series of trademarks suggest something called Legends of Runeterra is in the works, and chances are good that it’s Riot’s new game. 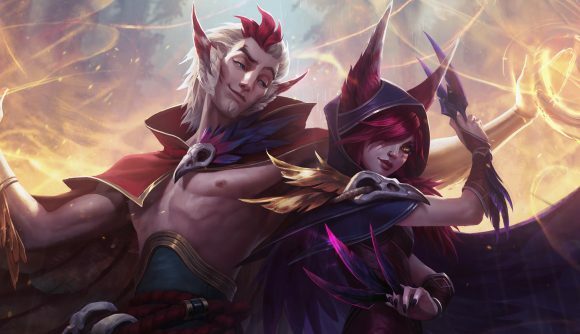 The League of Legends developer has ramped up promises of developing a new title over the past year, and these filings cover such a range of gaming and tie-in materials that you can expect a massive marketing blitz whenever this announcement becomes official. The trademarks cover items like “computer software development in the field of videogames,” and “arranging and conducting live competitions featuring videogames.” There are also toys, clothing, bags, backpacks, art prints, comic books, and plenty more. Riot has filed plenty of smaller trademarks on character names and such for merchandising, but this is a far more substantial round of trademarking around a single term. These listings were dug up by zileanpredicts on Reddit and noted by PC Gamer. While the scale of these trademarks certainly suggest a new game, there’s no guarantee that’s what Legends of Runeterra is. It could simply be a renewed merchandising blitz for League’s myriad champions. But as the company promises to put the ‘s’ back in ‘Riot Games,’ we’ve got to see an announcement sooner or later. We’ve reached out to Riot for further comment. Legends of Runeterra would certainly be a fitting title for the League of Legends fighting game that was rumoured after Riot absorbed Rising Thunder a few years ago. Company co-founder Marc Merrill tweeted about a League of Legends MMO some time ago. That Riot is working on new games is one of its worst-kept secrets. Back in August, Merrill told Variety that the developer is looking into projects across several genres. The overall aim seems to be to release a handful of new games every decade or so. The video features Van Roon alongside gameplay producer Jessica ‘Safelocked’ Nam, lead champion designer Ryan ‘Reav3’ Mireles, and personalisation lead producer Anna ‘Supercakes’ Donlon. Towards the end of the video, they answer a question about the pluralising ‘S’ at the end of Riot Games, and whether the studio is going to release a new game in the future. There are some comments about the Riot board game, and some of the smaller mobile and browser games they’ve released, but according to Variety, Merrill dismissed those as not representative of the studio’s second title. Right at the end of the video, Meddler asks whether Riot plans to release “any larger, other games someday.” Safelocked says that’s a “mystery,” but then Meddler stage-whispers a very pointed “yes” to the camera.